Random Film of the Week(end): The Bad Sleep Well | "DESTROY ALL FANBOYS!" Of all Akira Kurosawa’s films set in contemporary Japan, The Bad Sleep Well (Warui yatsu hodo yoku nemuru) and High and Low (Tengoku to Jigoku*) are probably my two favorites. Nope, I can’t choose between either as better thanks to both doing what they do so darn well in the hands of the master director. I’ll get to the latter film in a separate post, so let’s get to some “Bad” business from this point on. In addition to powerful performances from a great cast led by Toshiro Mifune, the film packs one of Kurosawa’s most abrupt and shocking twists in exactly the right spot that’s still one of the best collective gasp moments I can recall in a film that wasn’t a jump-scare packed horror flick. I first saw this during its revival in the 1980’s and the big twist sucked all the air out of the small theater and had people talking about it afterwards in a coffee shop afterwards as they debated the scene’s impact and how “un-Hollywood” it was. Mifune plays Kōichi Nishi, a young man working as a corporate secretary marrying into the wealthy Iwabuchi family whose patriarch (Masayuki Mori) is Vice President of a huge construction company under investigation by the police. During a somewhat tense reception after the wedding cake is rolled in, a second, more elaborate cake arrives that’s shaped like the corporate offices, but with a flower sticking out one of the windows. This cake shocks the company executives because that window is one that an assistant chief officer leaped from rather than testify against the company in a huge bribery scheme. No one has a clue who had the cake sent, but this becomes slightly less important after another executive is arrested during the reception. As the film progresses, we discover Nishi’s marrying the veep’s disabled daughter, Yoshiko (Kyoko Kagawa) is part of an extremely elaborate revenge plan I won’t spoil because it’s so integral to the plot (and the assorted surprises it hits you with as things progress). That opening sequence is sheer brilliance because Kurosawa sets it up with a group of reporters outside the reception talking to each other (and the audience watching) about the different characters the film will later explore in more detail. The scene also reminds me of the wedding party scene in The Godfather where Coppola allows reporters to introduce the viewer to most of the major players early on during a relatively comfortable gathering with an undercurrent of the menace to follow as that film progresses. 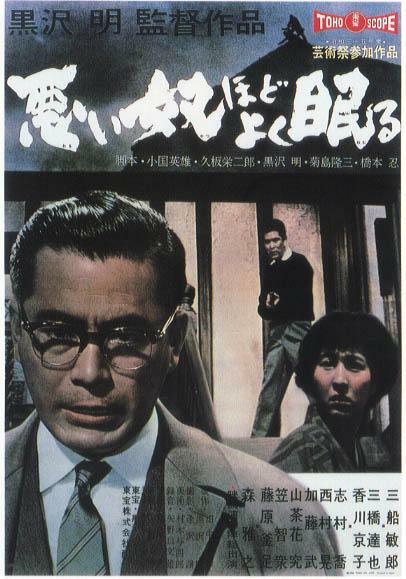 Given his love for Shakespeare, Kurosawa retrofits Hamlet’s tale of revenge quite well into his story of frightened lower level employees literally killing themselves because they believe it’s better to meet a hasty demise than the police investigating the company for its assorted alleged criminal activities. Nishi manages to save one executive named Wada (Kamatari Fujiwara) from a particularly hot volcano bath (what a way to go!) and uses him to get to another executive, with plans to keep moving up the ladder until he’s exposed the Vice President and perhaps more top executives once his plans run their course. Unfortunately, things don’t go as planned on a few fronts thanks to external factors Nishi didn’t take into consideration before spilling a few beans too many. Let’s just say that sometimes the best intentions go awry when people you bring into your small circle of one decides to take certain matters into their own clumsy hands. All the earlier triumphs Nishi has are undermined by both his own words (well, too many to one particular character) and by the actions of that Veep who finds out what’s going on and responds with the aforementioned shocking twist you most likely won’t see coming. What’s so incredible about that twist is it happens late in the film and knocks all the wind out of it (and you, most likely), but the finale actually sweeps matters up into an interesting, brief coda that, if you were hooked into the film from the start is very satisfying… but only to a point. Kurosawa wanted to poke his lens in the eye of Japan’s seemingly unstoppable corporate corruption during that time and he does so mercilessly, skewering the culture for literally having lackeys throw themselves under a bus (or into a volcano) while the suits at the top escaped prosecution once a case was now turned cold by an uncooperative dead body or two (or more). This entry was posted in Commentary, DAF, Features, Movie Posters, Updates and tagged 1960, 2013, Akira Kurosawa, Classic Film, Classics, Commentary, Criterion, Drama, Humor, Imports, Japan, Movie Clips, Movie Trailers, Movies, Random Film, The Bad Sleep Well by geelw. Bookmark the permalink.